Heat oven to 400°F. In large bowl, mix strawberries (with juices) and 1/4 cup sugar; set aside. In medium bowl, cut butter into flour, 1/3 cup sugar, the baking powder and salt, using pastry blender or 2 forks, until mixture looks like coarse crumbs. Stir in milk. Place on lightly floured surface; knead 5 to 7 times or until dough forms. Pat dough 1/2 inch thick; cut out 12 rounds with 2 1/2-inch round cutter. Place on ungreased cookie sheet. Brush egg yolk over rounds; sprinkle with 1 teaspoon sugar. Bake 12 to 15 minutes or until golden brown. Cool 15 minutes. 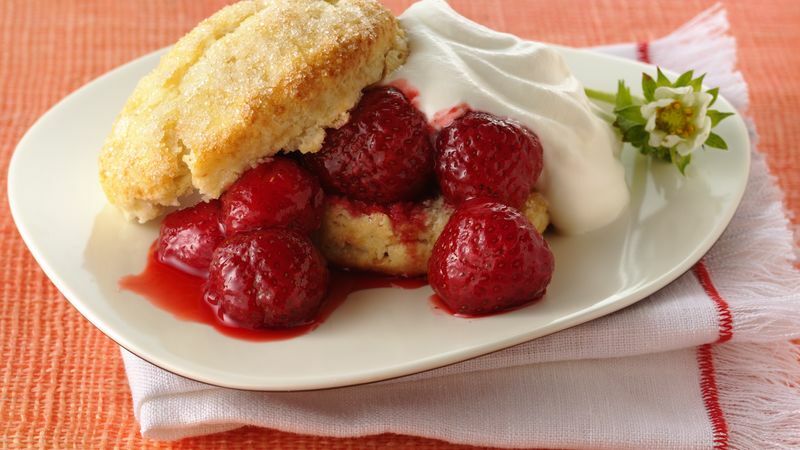 For the most tender shortcakes, knead gently and handle the dough as little as possible. Use your favorite Cascadian Farm® frozen organic fruit for the strawberries.